In what seemed equivalent to the entrance of a rock star taking the stage to entertain thousands of fans, YouTube CEO Susan Wojcicki kicked off the introduction of numerous tools for content creators at VidCon Thursday as part of a program aimed at helping them generate higher revenue from videos. Creators will soon have tools that easily acknowledge contributions, helping to produce videos through Creator Credits when tagging collaborators with more than a dozen titles, like actor, writer and editor. The YouTube Creator Studio, now available, allows creators to manage videos on the go through an app for Android -- and in the coming weeks, for iOS. Annotations will become interactive information cards with a clean look and require one-time programming to work across desktop and mobile. Some will have an opportunity soon to test the cards and create revenue by selling merchandise directly through videos. YouTube will also launch a music countdown show hosted by YouTube star Jenna Marbles on SiriusXM Hits 1 Channel, under a deal between Google's video company and the satellite radio platform, which focuses on 15 emerging and popular artists on YouTube. 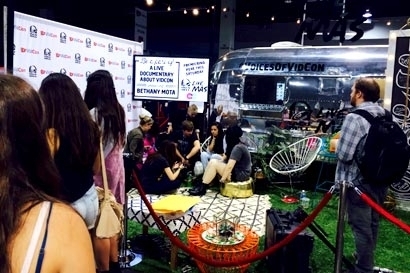 YouTube created the video star, but there is no shortage of major brands wanting to share the spotlight and connect with creators at VidCon. Taco Bell, Best Buy and HGTV are among others. VidCon creates a venue to connect with fans face to face. Jamie Byrne, director of content and commercialization at YouTube, told Online Video Daily that brands were brought in to gain a better understanding of the fans and the creators. "We brought in Taco Bell, Best Buy, Aeropostale, Sony, and Disney, as well as agencies like OMD and Deutsch," he said. "We spent about an hour introducing them to some of the most popular creators like Bethany Mota, iJustine and One Boyce Avenue." YouTube offers a Brand Partner program to teach brands how to make better content and introduce them to producers. Byrne said about 100 brands will go through the program this year. About 40% of the content gets viewed on mobile devices vs. desktop, especially when looking outside the U.S. in Malaysia and India. Some of the sessions are held at participating brand headquarters, while others will be held at YouTube Space L.A. and soon at YouTube Space New York when it opens in October. Food channels have exploded on YouTube. The video site's creators at Epic Mealtime have been working with A&E on a television show, said Byrne. "We're beginning to see complementary strategies between YouTube and television," he said.